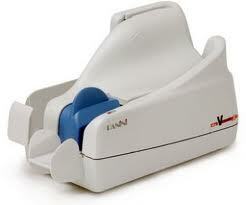 Panini My Vision X Check scanner 30 dpm with 30 document feeder This is a pass-through check scanner with ink endorser. Most of the units come in white but we do have a few that are black. For more information Call Hardtec at (408)846-2708 or email mfaris@aol.com for more information of repair or exchange programs.